I am back on the articles! I have been very busy with a fire in my business location back in March, and new projects with our research foundation, and of course remodeling our academy and the new look. 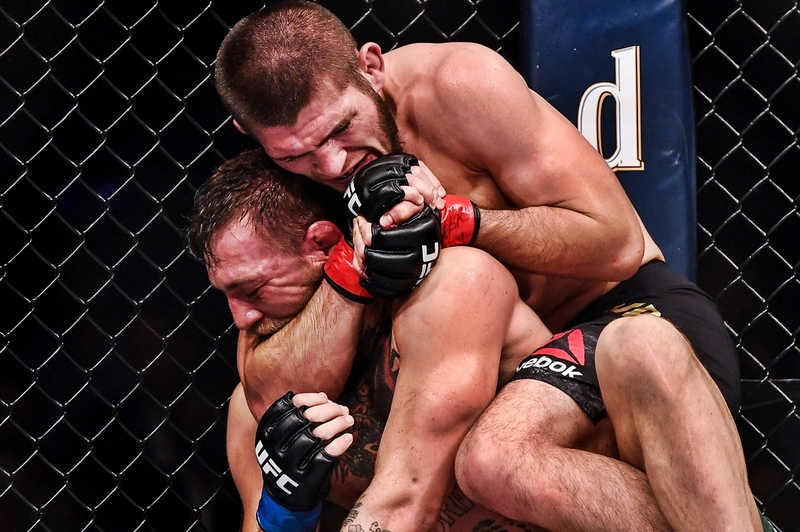 At UFC 229 Khabib Nurmagomedov (27-0) out struck, outwrestled, outfought and dominated UFC superstar Conor McGregor (21-4) to defend his UFC lightweight title via fourth-round submission at T-Mobile Arena in Las Vegas. The UFC has become somewhat of a circus. I hosted Khabib vs. Conor fight with guests, and it was in many ways the most appalling representation of mixed martial arts events. It was a shame and black eye regarding disrespect, dishonor, arrogance, narcissism, and a shameful display of a sport to Martial artists, fans, and especially to children. But lets take a look at why. And no, Khabib is not the fault here. Was it out of line to jump out of the ring? Yes. Was it his fault? No. Go look at the cause and effect of this problem. Dana has been in the UFC for almost 20 years. He used to be a bellhop and later moved to Las Vegas, where he managed former UFC fighters Tito Ortiz and Chuck Liddell. Dana knew a Fertita brother who he convinced to purchase the UFC. Dana was made president. From there the UFC has had struggles and successes. More up to modern day, when we end up with the UFC 229 fiasco, all the finger pointing has been at Khabib. UFC chose to skip Nurmagomedov’s traditional post-fight interview in order to play it safe. “If I put this belt on you, everybody’s going to start throwing s–t into the Octagon,” White told Nurmagomedov. Ok, so what happened? What caused this, the intensity of the fight? No, it’s the same drama the UFC has to enact to enrage fans, fighters against each other for one reason, PPV orders. Dillon Danis, a training partner with Conor was who Khabib went after outside of the ring. Then Conor was in an altercation in the ring. Then the entire brawl ensued. “What happens here is, there have been three guys arrested, there are going to be files charged against them, I’m sure. God knows what the Nevada State Athletic Commission is going to do to Khabib and his guys, I think they’re fighters,” White said. At the post-fight presser, Dana said that the Nevada State Athletic Commission will launch an investigation into everything and is withholding Nurmagomedov’s $2 million purse as they do. McGregor’s $3 million purse was not withheld as the NAC didn’t see any evidence to do so. 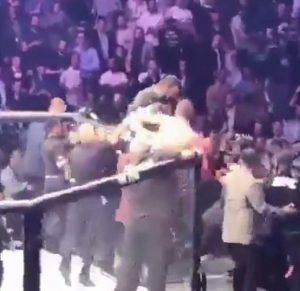 Above you can clearly see judge, jury and executioner regarding the charges on Khabib’s teammates. And remember Dana stated clearly they don’t know consequences along with possibly losing their visa. And they are still holding Khabib’s purse, but not Conor. Really? UFC president Dana White says ultimately McGregor opted not to press charges against them. White revealed at the UFC 229 post-fight press conference. “So the guys that they did have were released. 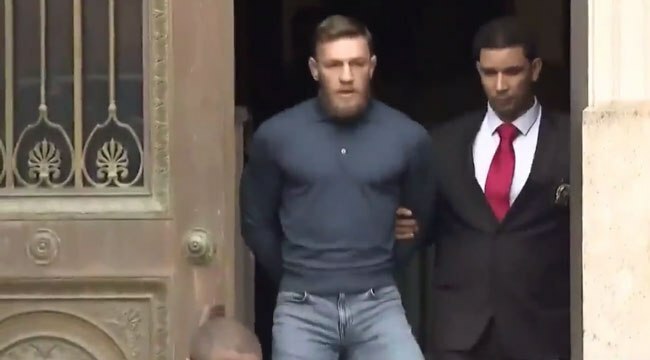 There were three guys from Khabib’s team arrested, I think they were from Khabib’s team. 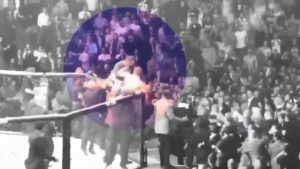 As far as the athletes involved in the melee outside of the two main event fighters, White says that if they are under contract with the UFC, they’ll never compete in the Octagon again. 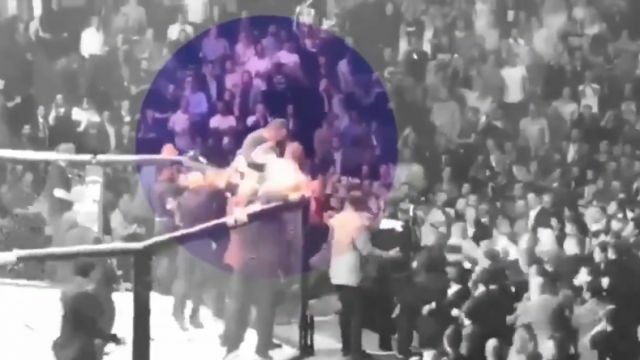 Radio host Joe Rogan, who was cageside at UFC 229, says Dillon Danis, a member of Conor McGregor’s fight team, was taunting Khabib Nurmagomedov, before the Russian lost his cool, and leaped out of the octagon to attack him. 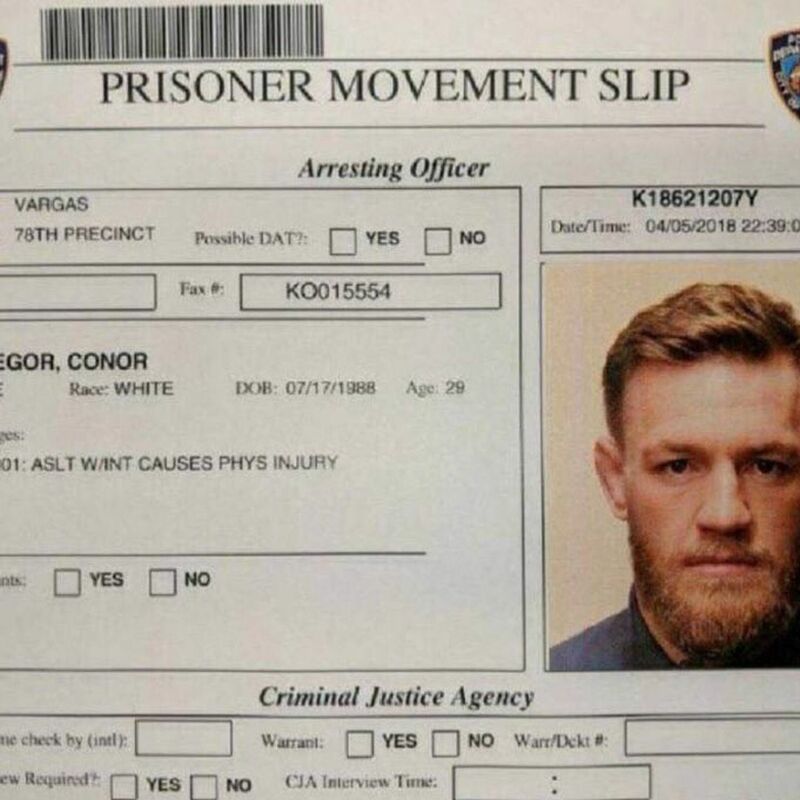 – Conor agreed to a plea deal at a hearing at Kings County Courthouse in Brooklyn, New York which saw all felony counts against the popular fighter dismissed. – Per the terms of the plea deal, McGregor pled guilty to one count of disorderly conduct and forced to undergo five days of community service, 1-3 days of an anger management evaluation, and required to pay restitution for the damage he inflicted on a UFC fighter bus during UFC 223 fight week. 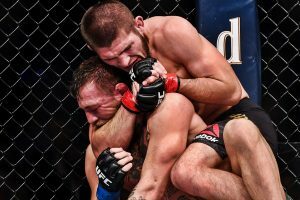 – Not only was Michael Chiesa forced out of his lightweight tilt with Anthony Pettis after sustaining lacerations to his face from McGregor throwing a dolly through a glass window, but Ray Borg had to pull out of his flyweight matchup with Brandon Moreno after reportedly having trouble seeing. – Dana White stated he would let the legal system take care of Conor. 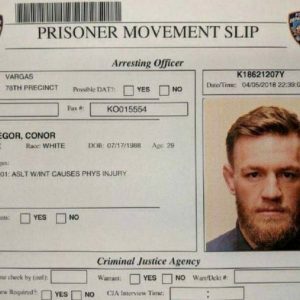 – Conor received five hours of community service and mandated anger management classes after his lawyers copped a plea bargain. “We’ll see what happens,” White told TMZ. So here, Conor did not press charges. Why? Well, let’s look at the evidence. He would have perjured himself with a statement. Above statement by Joe Rogan shows the taunting to Khabib and his camp. Yet, what else? UFC didn’t suspend Conor when he threw that dolly through the bus. Conor jumped out of the ring and confronted Jose Aldo Junior. Conor threw the bottles at Nate Diaz. Conor called Khabib’s Dad a quivering coward. Conor called Khabib’s manager Ali Abdelaziz a ‘f****** snitch, terrorist and rat’. – Conor has stated in past news using racist and bigoted statements. Anderson Silva is probably semi retired. Jon Jones has so much steroid damage on him, his greatness is always marred, and may or may not see him again. Rhonda Rousey was Dana White’s biggest investment. He named her as the greatest fighter, yet when she fought an actual striker who has professional striking (Holly Holm) it was an embarrassing loss to her. And Amanda Nunez destroyed Rhonda, her Judo, and her career. Yet Amanda was never promoted like Rhonda. This favoritism is what will cost the UFC. I think Nate beat Conor both times, as even in the last round of their second fight, Joe Rogan comments that Nate got the takedown and that may have sinched the decision. Why didn’t Khabib, or even Nate get the title fight with Eddie Avelar? The UFC will not have another Rhonda or Conor. Both were priorized for the UFC. Yet if Rhonda lost to Holly, who at that time wasn’t even a top five, and Conor lost to an out of shape Nate Diaz who wasn’t even in the top five, how can they ignore so much talent for the future of the UFC? No Dana, your wrong. We have a first amendment right, and is not subject to the whims of your views against race, color, creed or religion. Just like our Supreme court of the USA found secular humanism a religion (Torcaso v. Watkins the Supreme Court), all religions are to be respected, including atheism, Christian, Jewish, and Muslim. NSAC chairman Anthony Marnell told ESPN on Monday (October 8) the commission is conducting a full investigation into the melee that took place after Nurmagomedov’s championship victory against McGregor. The investigation includes lengthy film review and interviews with people involved. 11. 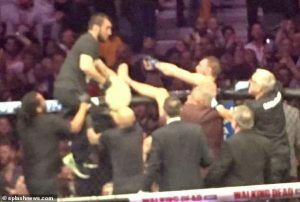 However, it can then be seen, that the Irishman throws a punch at one of Nurmagomedov’s crew-mates, as he is on top of the fence along with McGregor.